Our jackal gallery features mainly black-backed jackals (Canis mesomelas), but there are also some images of side-striped jackals (Canis adustus). Black-backed jackals are found in two distinct populations, the one restricted to southern Africa, and the other much further north in East Africa, from Tanzania to Ethiopia. This is the jackal you're most likely to see if you're on safari in Southern Africa, or in Kenya and Tanzania in East Africa. The side-striped jackal is found mainly in central Africa, but also extending into east Africa and south into countries like Zambia. 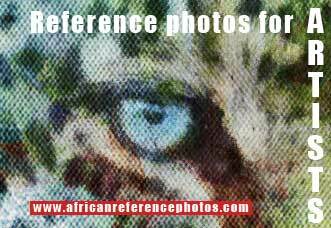 This animal is regarded as rare, although not under threat. Generally though, if you see a jackal while on an African safari, it's much more likely to be the black-backed variety, which is much more common. There is a third species, the golden or common jackal (Canis aureus) which is found throughout the North and Horn of Africa. Black-backed jackals, although mainly nocturnal, can often be sighted during the day in game reserves and national parks, where they are not hunted or in conflict with man, as is the case in farming areas. Capturing images of jackals, while not always easy, is certainly doable while on safari, particularly if you have a reasonable telephoto lens in the 300mm range. Jackal pairs form long-term bonds, so it's not unusual to see two black-backed jackals together, although sightings of their pups are more difficult as they keep them safe in a den until they're old enough to venture out with their parents. In daylight, jackals will usually be found resting in the shade of a tree or shrub, so there is the problem of contrasty light. If you don't expose for the shadows, your subject will be very dark with no details. So you need to compensate and make sure you are exposing for the shadow area, using a spot meter if necessary. The downside is that the sunlit areas will be over-exposed and blown out. One way of balancing the shadows and brighter areas is to use fill-in flash -- but be careful not to over-do the flash as the resultant photo will be over-exposed and can also look very artificial. 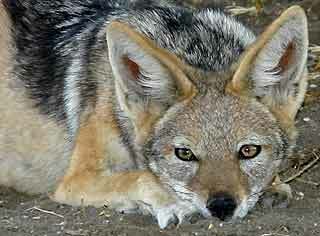 See also Jackal Information for more detailed information and facts about the black-backed jackal.